Sleepy pilots and air traffic controllers are under more scrutiny by the Federal Aviation Administration (FAA). 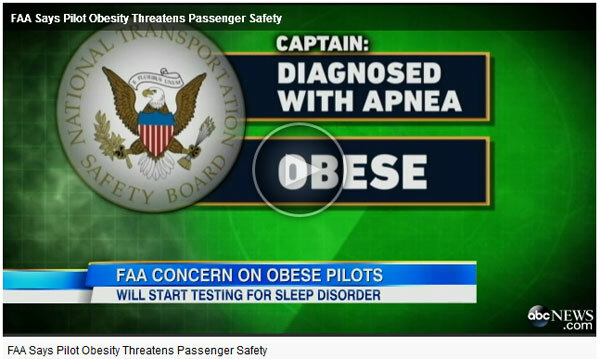 One such recommendation is that overweight pilots be screened for sleep apnea. Both true and near-miss plane crashes have been blamed on fatigued pilots. The article goes on to say that all obese pilots and air traffic controllers will need to be screened by a sleep specialist and receive a medical certificate before they are allowed back to work. The problem is OSA or obstructive sleep apnea. It is common in obese people, results in a lack of sleep or poor quality sleep which, in turn, can cause them to remain sleepy during the day. The screening is a result of two pilots falling asleep on a landing in Hawaii and overshooting the runway. There was no incident, thankfully. The findings: the captain was obese and was later diagnosed with sleep apnea.